A Research Networking (RN) tool is a web-based, comprehensive knowledge management system that harvests information about individuals’ research and scholarly expertise into searchable, networked profiles. RN tools, which often include powerful network analytics and visualization capacity, offer passive and active networking of expertise profiles to identify potential new collaborations. This workshop first examines RN tools from the main content providers’ perspective—the researcher. Next, representatives from three institutions provide an overview of different RN tools and how they are being used to facilitate new collaborations and team science. Finally, the workshop will inform about the efforts of a national RN initiative focused on developing interoperability between RN tools and creating a federated national network. David Eichmann, Ph.D., is the Associate Director for Biomedical Informatics and an Associate Professor of Information Science in the School of Library and Information Science, with a joint appointment in the Department of Computer Science. He is a member of the Health Informatics Steering Committee and a member of the Executive Council for the Center for Bioinformatics and Computational Biology. From July 2002 to June 2006, he also served as Director of SLIS. Dr. Eichmann received his PhD in Computer Science from The University of Iowa in 1989, with a dissertation in database theory. He has been on the faculty at Seattle University, West Virginia University and most recently at the University of Houston - Clear Lake, where he chaired the Software Engineering program and was Director of Research and Development for the NASA-funded Repository Based Software Engineering project. MORE, one of the systems developed as part of RBSE, received a NASA Group Achievement Award in 1998 from Johnson Space Center and was nominated in 1998 by JSC for the NASA Software of the Year Award. Since his return to Iowa in 1997, Dr. Eichmann been working on information retrieval and intelligent agents, particularly with respect to information filtering, extraction of named entities and multimedia clustering. Teri Grieb, Ph.D., is the Senior Director of Administration for Research at the University of Michigan Medical School, Office of Research and Managing Director for the Michigan Institute for Clinical and Health Research (MICHR). In these roles, she partners with the Senior Associate Dean for Research and the Associate Dean for Clinical and Translational Research in advocacy for the research mission of the University of Michigan Health System. As the chief business and administrative officer for the research mission, Dr. Grieb is responsible for the operational and fiscal management of the Office of Research and its reporting units. She assists with devising and deploying strategic research initiatives; managing projects; and advising on policy, procedural, and operational issues for the research enterprise. Dr. Grieb also serves as the lead administrative liaison and primary staff interface between MICHR and the institution, and representing MICHR to the NIH/CTSA consortium. Dr. Grieb holds a Ph.D. from the Genetics Program at George Washington University. After receiving her doctorate, she joined an early-stage, life sciences start-up company. She was the Director of Tissue Biologics and lead scientist responsible for developing the company’s licensed technology for sterilizing allograft tissues. Dr. Grieb then joined MedImmune, Inc., as the first project manager for Research Operations, where she oversaw commercial and university in-licensed technologies. Prior to her current roles at the university, Dr. Grieb joined the Office of Research as the Industry Research Liaison and was responsible for planning and implementing outreach activities to increase participation in technology transfer and foster entrepreneurship. Kristi Holmes, Ph.D., is a Bioinformaticist at Becker Medical Library and a research instructor in the Department of Genetics at Washington University School of Medicine in St. Louis. Her work includes the development and presentation of workshops and courses across the basic science and clinical communities as well as the application of bioinformatics resources to research problems through individualized consultations and collaborative relationships. Dr. Holmes is a member of the Washington University Institute of Clinical and Translational Sciences and works in close partnership with various groups on campus to develop and support cross-disciplinary initiatives. Her professional interests include collaboration support, open science, social network analysis, and understanding the impact of research efforts. She is a member of the Scientific Advisory Board of the journal Science Translational Medicine. Dr. Holmes serves as the National Outreach Coordinator for the VIVO: Enabling National Networking of Scientists effort (http://vivoweb.org) and will serve as the program chair for the 2011 VIVO conference, to be held August 24-26 in Washington, DC. Maninder Kahlon, Ph.D., is Chief Information Officer for the Clinical & Translational Science Institute (CTSI)) at UCSF, and serves on its Board of Directors. She also leads CTSI’s Virtual Home and Consultation Services programs. Mini works with the National Clinical & Translational Science Award (CTSA) consortium as co-Chair of the National Research Networking Working Group and serves on the CTSA IT External Advisory Committee. At UCSF, she serves on the Research IT Steering Committee for the university. Mini received her Ph.D. in Neuroscience from UCSF where she worked with Steve Lisberger to research the neural basis of learning and memory. She subsequently worked at Silicon Valley software and wireless startups and in the non-profit sector prior to returning to UCSF to work at CTSI. David Marshak, Ph.D., is a professor in the Department of Neurobiology and Anatomy at the University of Texas Health Science Center at Houston. His research deals with the anatomy of neurons in the primate retina and is supported by the National Eye Institute. He has studied this topic as an undergraduate at Cornell University, as a graduate student at the University of California at Los Angeles and as a postdoctoral fellow at Harvard University. He has been at UT-Houston since 1984, and he teaches human anatomy and various graduate level courses in neuroscience. He also does research on the role of repeated practice in learning with support from the Teagle Foundation and is PI of a training grant from the National Institute for Neurological Diseases and Stroke that supports medical students conducting research in neuroscience. The Provost at UT-Houston, Dr. Peter Davies, wanted faculty input about research information systems, and he asked Dr. Marshak to meet with faculty members at all six schools to learn about their past experiences with research information systems and their needs for the future. He did this with help from Dr. Todd R. Johnson, then at the School of Health Information Sciences. They learned that biomedical scientists are enthusiastic about using research information systems, provided that they can contribute without much change their normal work flow. In addition to the benefits envisioned by the designers of these systems, they want them to free up time for more scholarly work by providing essential documents. Griffin Weber, Ph.D., is an Assistant Professor of Medicine and the Chief Technology Officer of Harvard Medical School, whose vision is to break down the silos that exist in biomedical research, by using computer science techniques to connect scientists across different institutions and disciplines and to help them analyze the countless clinical and biological datasets that remain inaccessible to most investigators. To accomplish this goal, he has developed several open source software applications that are used in universities and hospitals around the world. One of these, named Harvard Catalyst Profiles (http://profiles.catalyst.harvard. edu), automatically locates information about scientists on the internet and discovers how their research is connected. 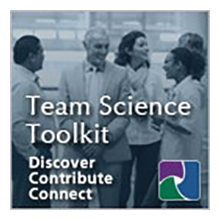 The software has numerous applications, ranging from helping individual investigators find collaborators to understanding the dynamics of an entire research community. Another program, Informatics for Integrating Biology and the Bedside (i2b2), is a web-based platform that enables a variety of functions related to clinical research, including queries of large data repositories, visualization of temporal data, and identification of random matched cohorts. He also created the Shared Health Research Information Network (SHRINE), which is a federated query tool that connects i2b2 databases at different hospitals, enabling researchers to perform large cohort trials and to study rare diseases. Dr. Weber studied biomedical engineering as an undergraduate at Harvard, and he stayed at Harvard to complete medical school and a Ph.D. in computer science.